Recently, while looking for something in the rare periodicals collection at NYAM, I came across a charming allegorical frontispiece that appeared in the first volume of The Medical Museum, a short-lived journal that appeared in three volumes published in London 1763 and 1764. The editors of the journal, who described themselves as “Gentlemen of the Faculty,” remain unknown. The subtitle and the introduction make clear that they viewed themselves primarily as the collectors and disseminators of already published works from a variety of sources. Even 18th century people struggled to make sense of an overwhelming amount of information. 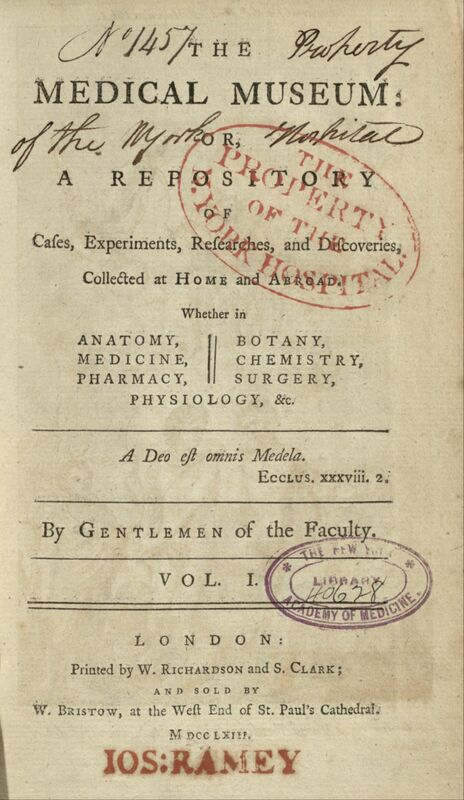 “Many physical people very justly complain of the great expense attending the purchase of medical treatises, especially foreign ones… the pains and time to select and examine the matters that may concern their profession, are with many too much to be dispensed with,” (ix) they noted, while explaining the task they had chosen for themselves, that of serving as the selectors of the most useful materials from disciplines ranging from anatomy, medicine, chemistry, botany and other assorted sciences. Works from a remarkable range of publications appear in the Museum, many of them translated from their original languages into English to make them more accessible, as the compilers hoped their journal would find an audience among the public, not just among medical men. 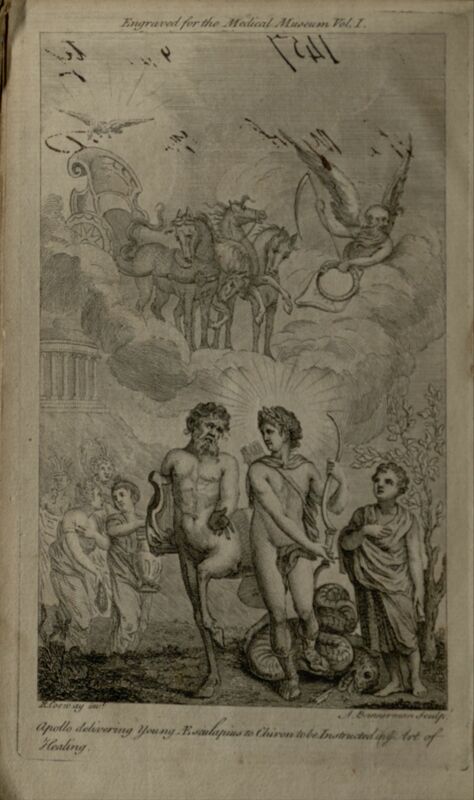 The first volume contains a specially engraved frontispiece that shows Apollo bringing his son Asclepius to the centaur Chiron to learn about the art of medicine. Coronis, Asclepius’ mother, was either killed by Apollo for being unfaithful to him or died in childbirth, and Apollo rescued the unborn baby from her womb. Needing someone to raise the boy, Apollo handed him over to Chiron, who taught him the healing arts. Asclepius went on to father many daughters, some of whom are also remembered for their connections to medicine and health. One of his daughters, Hygeia, is the goddess of health, while another, Panacea, is the goddess of universal remedies. 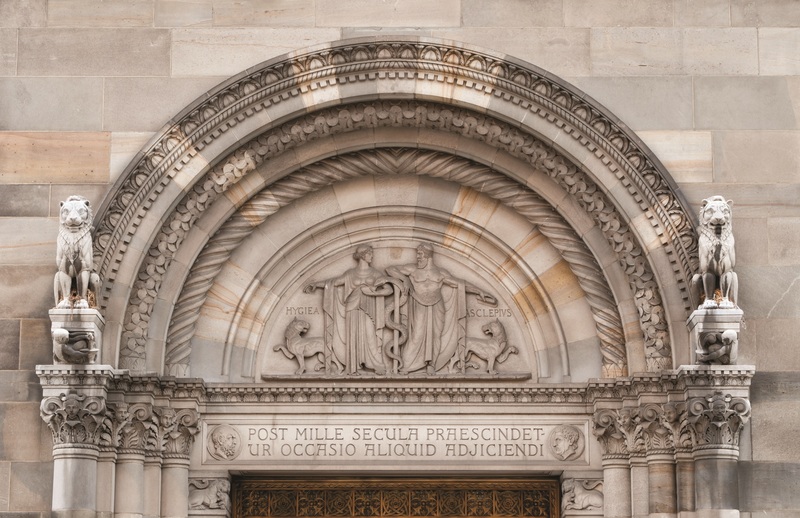 If you visit The New York Academy of Medicine’s building, you will see that Asclepius and Hygeia were important touchstones for NYAM and for the building’s designers as well. An ornamental frieze above our front door depicts the two of them together, attended by their snakes and dogs, a visual reminder of the classical heritage of medicine. This entry was posted in Collections, History of medicine and tagged historical collections, history of medicine, Item of the Month, rare books by nyamhistofmed. Bookmark the permalink.